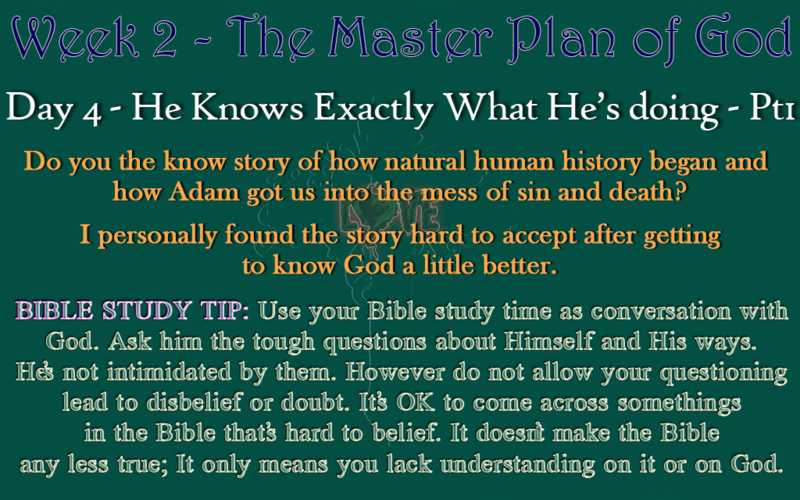 We all know the story of how natural human history began and How Adam got us into the mess of sin. God created the earth and man perfect without diseases, sicknesses, death or any other bad thing you could think of as we see today in our world. Then God put in the middle of the garden the tree of knowledge of God and evil and commanded Adam & Eve not to touch it or they will die. Why? well like we’ve all learned God does not want robots for relationship so He gave them a choice to choose to obey Him or disobey Him. The devil came in the garden, deceived Eve and got her to disobey God while Adam was standing there watching it all and then he also took a bite of the fruit and BOOM all hell broke loose. God came and pronounced judgement on them including the earth and through that the perfect earth and man God had created got infiltrated with sin, diseases, death and “all that jazz” (i.e. every evil thing you could think of). So how did I do with that summary? I hope I didn’t miss anything. This is a good time to refresh your memory on the fall of Man in Genesis 3. Before I continue I just want to apologies first for what I’m about to say; in case you get offended or defensive. Just know that I’m on your side :-). I found this story and the reason I was told behind the fall of man tough to accept after coming to know God a little better. FROM ME TO GOD: “Seriously, God that’s it? All the mess we find ourselves in today here on earth started cos of that? From the beginning, you created Adam with a free will and he chose to follow you, He wasn’t going along with you like a robot; sure he didn’t have any other voices (options) apart from yours; But why that particular tree? Why does it have to be a tree with death (separation from you) as the consequence? Why did you put a tree like that in the garden when you knew for sure they were going to disobey you anyway? or did you not know? And also the devil. What was he doing on earth and in the garden? Why did you allow him in the garden to deceive Eve to bring such a severe consequences (which you had put in place) on your most beloved creation? God, I remember what you did in the time of Noah with the flood; at the tower of Babel with the confusion of languages; and even Sodom and Gomorrah with the fire. In all of these circumstances you intervened irrespective of (against) man’s free will so that your divine plan and purposes could stand. Father from what I can see if you’d intervened with Adam against His will from eating of that tree, none of the others would have been necessary. Everything wrong with the world started with them and most importantly Jesus would have no need to become a man to die the most humiliating death; a criminals death to redeem us from the mess Adam got us in. Father, from what I can see all that took place then was because you allowed it knowing full well what would happened afterwards. The devil, the tree, the consequences and even the curses (judgement); you set the boundaries for them all. OK, LET ME EXPLAIN WHAT I JUST DID HERE. BIBLE STUDY TIP: Don’t be scared or nervous of asking God the tough questions that you genuinely like to know. He is not intimidated by our deep and cleverly invented questions…haha. The Bible was meant to lead you into conversation with God. Think about it…From Adam to Moses was about 2500 years period. And all we have for those period is the Book of Genesis. It was impossible to carry a record of everything that took place and therefore God specifically and purposely choose to highlight the ones He deems necessary for us to know to unfold His-story according to His eternal purposes. Many of the stories, He simply just hinted on which I believe was meant for us to talk to Him about them. He was there when those events took place and He can give you more insight than what 4 years of Bible school ever could. Almost every question I’d ask God concerning His word and Himself I’ve got the answer for them. Most of the time I don’t get them immediately but in time He’ll give me the answer. It happens every time. Your questioning is not that of doubt and it shouldn’t be. If you come across something in the bible that is (seems) contradictory to what you know about God or another part of the scripture or something somebody said about God or the Bible which troubled you(i.e. confusion or doubt)…Guess what that means…; it means you lack an understanding on that part of scripture or on God. It’s not the Bible that’s at fault; It’s your understanding about it and an opportunity to gain more by seeking (asking & searching) God. In this way you have the freedom to ask any question you want and frame it however you want before God knowing in your heart that you’re not questioning or doubting God but humbly asking God for insight because you know you lack understanding. The Bible is TRUE. Period!. God is perfect. Period!. Anything therefore I come across in the Bible that seems wrong to me or even makes God look bad, mean, weak, small, etc, only means I’m the one that needs revelation and understanding not God or the Bible. This is why sometimes I like talking to atheist because they’ll say somethings that I would never have thought of or truthfully I would be scared to say of God. But then I’ll go and talk to God about it. They’ll say them to hold onto their doubt and beliefs but I’ll used them to learn more about God. With this stance, nothing can shake your faith or knowledge of God. Why? because it is not a PROBLEM, if you read the Bible or someone shows you somewhere in the Bible and God looks like a liar or murderer; even though you know that can’t be true. All it means that you don’t have the full understanding on that scripture or on God. And It’s OK not knowing *everything about God. if you do. If it’s troubling you, do Proverb 25:2 and keep talking to God (plus other believers) about it and He WILL give you revelations and the understanding in time. Don’t let other people’s or your own lack of understanding cause you to doubt or shake your faith in God. THIS WAS NOT THE ORIGINAL PLAN FOR TODAY’S DEVO BUT I PRAY THIS HELPS SOMEBODY.